A man on fire, “Yong” Panurat Chatsiriyongyong, gets some time off his training schedule to talk with us about his game! “Man to Man” is a new content for Tones & Definition where we will go out and interview some interesting characters in Thailand and South East Asia basketball. If you have any suggestions, feel free to do so here or at our Facebook page! Last Sunday’s game between Thewphaingarm and PEA might have been overlooked by many fans as it was folloing the weekly Big Match between Mono Vampires and Nakhon Pathom Mad Goats (which I covered here to some extent). Frankly, I have to admit that I overlooked this game myself. Thewphaingarm had yet to win in the BTSL and the recent form of PEA with close games against the Mad Goats and the resurgence with a new Import Player, Jon Cathey-Macklin, suggested that this would be an easy win for PEA. This game proved to me that I still know nothing about basketball and that the “Super” in Basketball Thailand Super League actually means something. You could have had a string of bad games before this, but no team in the league pool is a pushover. Thewphaingarm beat PEA on their own home court. For some fans, including myself, might be “surprised” with this result. 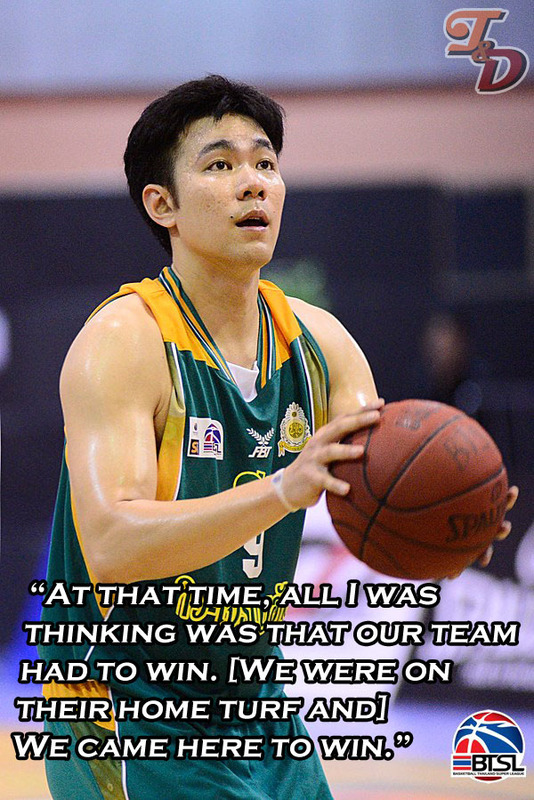 But for those who have been close to the Thewphaingarm players know that this team wouldn’t be pushed over till the end and that one person who shone brightest and exhibited what Thewphaingarm is capable of is “Yong” Panurat Chatsiriyingyong who bombed PEA for 7 three-pointers and 30 points. T&D: After you let loose all hell on PEA by going for 7 three-pointers and 30 points in total, can you describe what it feels like to be in the zone? To be “On fire”? JYP: At that time, all I was thinking was that our team had to win. [We were on their home turf and] We came here to win. T&D: Next thing you know, you were up at 30 points. JYP: I wasn’t even keeping count of how many points I had at that time. T&D: That is pure determination there. 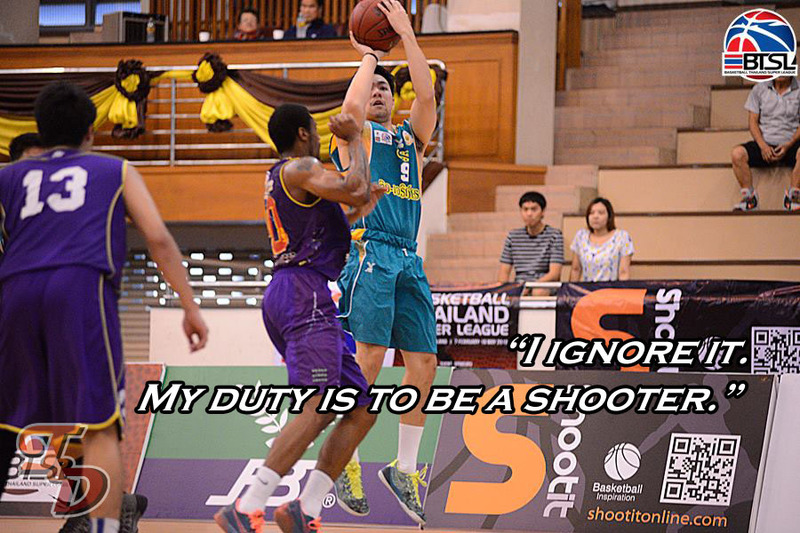 What do you think is the main key to good shooting such as your own? JYP: It’s all about practice. 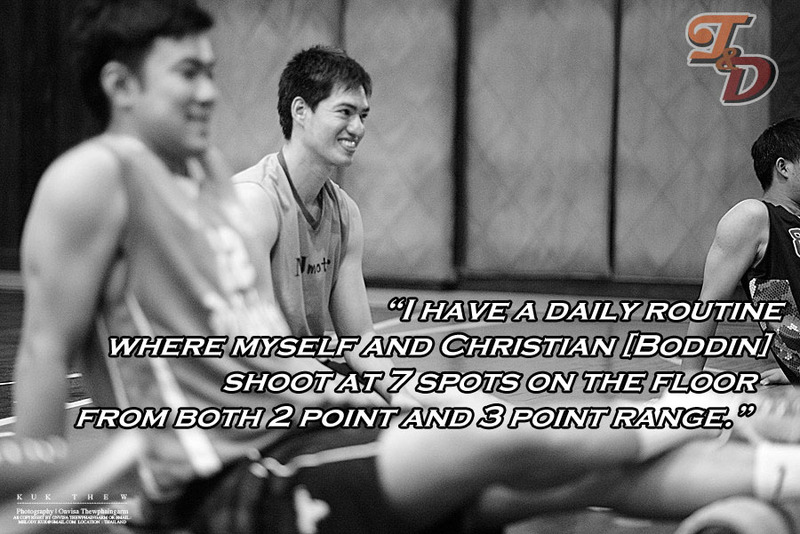 I have a daily routine where myself and Christian [Boddin] shoot at 7 spots on the floor from both 2 point and 3 point range. T&D: About 2-3 games ago, you were in quite a slump. [Editor’s note: From the stats in hand, the game against PEA on the 28th of February, Panurat shot 0 for 10. 9 being three-point shots.] 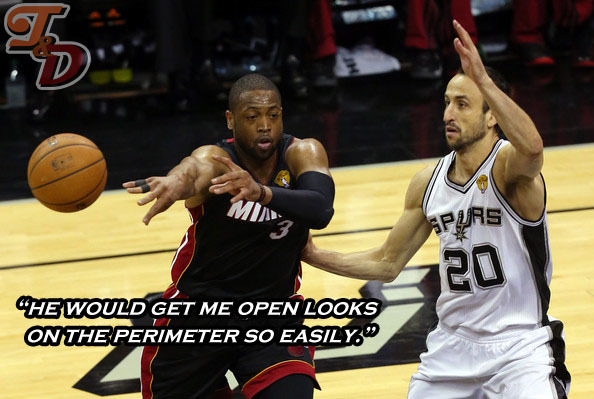 As a shooter, what do you do to get out of these slumps? JYP: ฺI ignore it. My duty is to be a shooter. But actually, that slump had me stressed out for a while. T&D: I guess it’s just normal. We all want to do out duties the best we can. T&D: Which area of your game do you look forward to improving on the most? JYP: I want to be more consistent. I want to be able to keep level of the form which I am performing at. In the past, I guess that put a lot of pressure on me. T&D: Who do you think is playing the best basketball in the BTSL right now? Or maybe just whose form are you most impressed with? JYP: I like Christian’s form right now. He’s a local Thai that can stop any import. 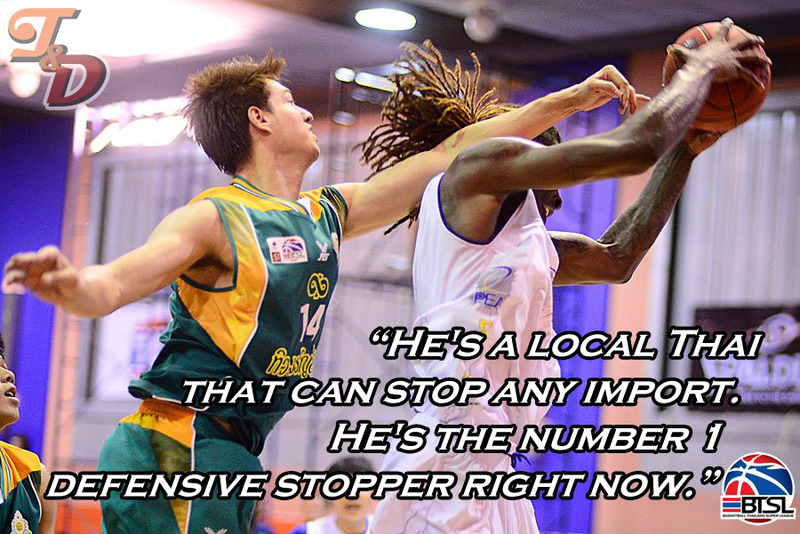 He’s the number 1 defensive stopper right now. T&D: Seeing that you’ve always been practicing together, I guess you had a close-up look at the effort he has put forth to go up against the imports. T&D: Who do you want to be team mates with the most, if you pick anyone in the world? JYP: I want to play with D-Wade [Editor’s Note: That’s Dwyane Wade of the Miami Heat] because he would get me open looks on the perimeter so easily. T&D: Well, that’s your idol there. T&D: And who do you want to go up against the most? You guard him, he guards you, that kind of stuff. JYP: Curry. 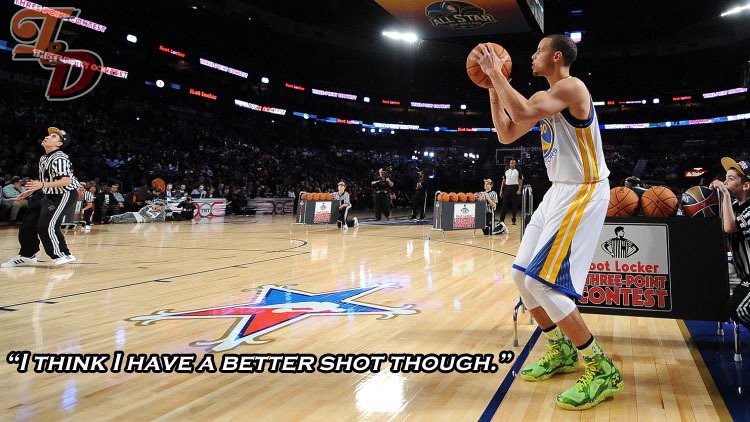 [Editor’s Note: Stephen Curry of the Golden State Warriors] I just want to see how quick his shot release really is. From the TV, it’s wicked quick. T&D: Well, I hope you get the chance to do so sometime. T&D: And I don’t have the stats to prove you wrong on that either. JYP: That was a joke. T&D: So finally, I think your 30 points hold the record in the BTSL for most points scored by a local. Do you thin that will hold up until the end of the tournament or will someone take that title away? Do you have anything to say about the Mono Vampires which you will play this coming Saturday? JYP: I think someone will eventually do it. As for the Vampires, they are a good team. They have a big import, and he’ll make us work harder. It’s going to be a rough game this Saturday. T&D: I’ll make sure to be watching this game. There you have it, our exclusive interview with the shooting star of the “Green Giants” Thewphaingarm. We got to see the determination and concentration. Every time it just fills up my heart with you they we are able to watch it all when their dedication turns out into spectacular performances such as Panurat’s. Stay tuned on the 4th of April to see if Panurat can keep consistent with his form and if Christian’s dedication in the weight room will work out against Mono Vampire’s Import, Anthony McClain. The game starts at 2PM onwards.